NBA Playoffs are heating up and we have a three-game slate to dive into. 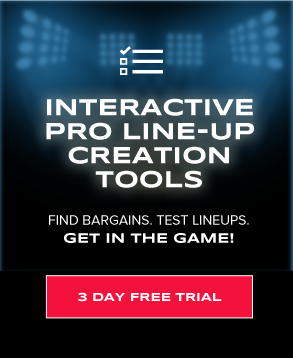 Head on over a for your chance to get DFSR PRO, which will give you access to our NBA FanDuel and DraftKings optimizer, our MLB Optimizer our player lab! Get started for free by clicking the button below. First time with NBA or MLB? 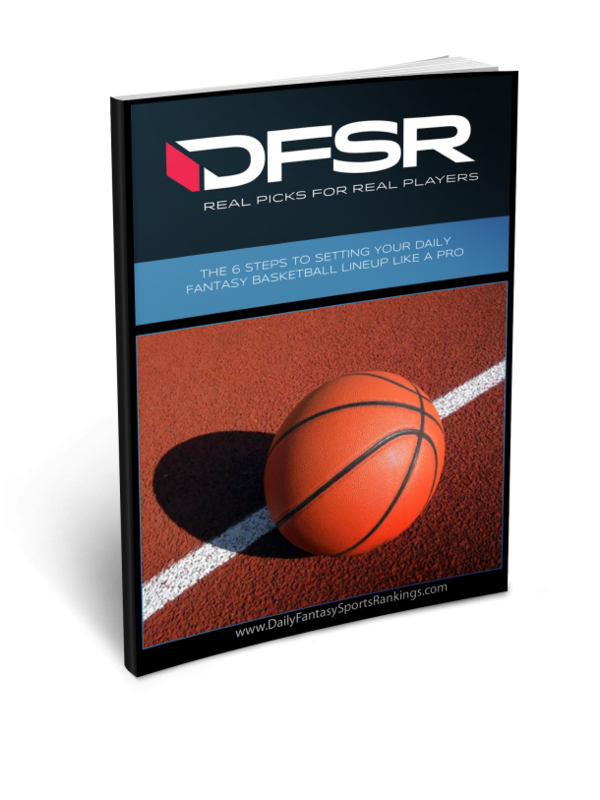 Be sure to read our free NBA and MLB Ebooks on building lineups, general strategy and more. We've got you completely covered. The Celtics beat the Pacers 84-74 in about as slow and methodical a modern-day NBA game you’ll ever see. This score was absurdly slow thanks to a grind it out pace on both ends and overall poor shooting. The teams combined to shoot only 35% total from the field and took on a combined 43 trips to the free throw line. We are bound to see both of those numbers tick up for game two and I expect it to be at least higher scoring. Boston took over the game with a 26-8 third quarter run that basically put the game out of reach for Indiana who will likely continue struggling on the offensive end. They have few reliable scorers and that was readily apparent in Game 1. I know this game looks *close* from the final score, but it’s worth noting that the Celtics were up 22 at about the 3:30 mark in the fourth quarter when they effectively pulled their starters. He also struggled from the field in his 25 minutes, going 3-11 and scoring only six points. It helps we are getting him cheaper and if the game stays closer I do think that run pushes over 30+. That’s probably a little bit of wishful thinking but it is for sure that the Pacers as a team offer some of the best value on this slate. I wouldn’t be shocked if Sabonis saw even more minutes in Game 2. The Pacers could desperately use his scoring touch and he does provide at least something of a problem for Boston on the defensive end. Also consider Wesley Matthews (FD $3800 DK $4100) and Thaddeus Young (FD $6400 DK $5900). Kyrie put up 20 points, seven assists and five rebounds in Game 1 over 34 minutes. He’s for sure a guy the Celtics would run 36-37 if the game stayed close (he came out with about three minutes left in the game). And you have to like that kind of upside at these prices. The Pacers don’t have much in the way of perimeter defense who can handle Irving (few teams do) and I wouldn’t be surprised to see his ownership pretty high on both sites. Proj Pts FD - 26.62 DK - 26.74 He drew the start for the injured Marcus Smart, but struggled in the role shooting only 1-5 from the field (0-3 from three) and finishing with just two points and five rebounds. It was a disaster. But the price barely moves, he should start again and I do think there’s some upside if things break right. He isn’t going to see a ton of usage with this first unit, but he’s an active defender and should be able to contribute enough to make him at least a FanDuel play. This game was over in about the first 2.5 minutes which is being generous. You could almost tell it was over on the first possession. The Pistons with Blake Griffin were a massive underdog to have any chance in this series. They have no chance without him. As much was evident early when the Bucks stormed out to a 38-18 first quarter lead and never took their foot off the gas. None of the Bucks’ starters were pressed into many minutes and that could easily be a theme for Game 2. In fact, no player (from either team) played more than 28 minutes in Game 1. Really none. I suppose you could take a flier on Thon Maker because he’s so cheap and will likely start for Blake Griffin again. But the dude can do a fat load of nothing even given minutes. Also, kind of none. I’m so worried about the blowout that I find it nearly impossible to assume any Bucks player sees anything close to regular minutes even though they’re all priced as such. Much like Milwaukee, Houston left very little doubt in Game 1, boatracing the Jazz 122-90 thanks to an efficient game on offense led by James Harden and the Jazz shooting somewhat poorly. These teams are more evenly matched than Game 1 would suggest, though Houston clearly has the edge in this series. Rubio looked competent/ good in the first half of the game but seemed to fall off in the second when the game started getting out of hand. It’s encouraging that Quinn Snyder felt comfortable rolling him a ton of minutes in Game 1, though I wouldn’t be shocked if Utah shifted some things around in the name of slightly better defense for Game 2. But for the time being, if we think he’s a candidate to play 33-35 minutes in a close game then his production likely gets you there on these prices. He isn’t cheap, but on this slate the two big money options are The Beard of Giannis. Because of the minutes *safety* I’m taking he Harden side. I think this game will be closer (Vegas agrees) and there’s a better chance Harden sees value at his elevated price tag. Utah allowed him to get to the rack over and over and he finished 11-26 from the field and 4-10 from three. He only went to the line three times which in some ways is a testament to playoff officiating but also because the Jazz clearly had no intention of committing anything close to a foul on him. That could shift in Game 2 and I expect Utah to get more physical with Harden. From a value play perspective, Gordon is coming cheap enough on both sites to consider. He only played 31 minutes in Game 1, but the reality should be more like 35 in a close game. He had 17 points on 5-10 shooting, with three rebounds and two blocks. The defensive stats are outliers, and scoring is where he makes his bones. The minutes floor is high enough to consider in the lower middle tier. I think Tucker, in a close game, has as much minutes’ upside as anyone on the team. They call on him to do so much defensively that if the game is close, they are going to want him on the court. He finished with 11 points, four rebounds and three assists in Game 1 which were darn close to his stats at halftime. The minutes don’t always translate to huge fantasy production (they rarely do) but on these short slates if I can get a guy cheap who could play in the high 30’s then I’m fine hoping the ball bounces his way enough.